There are these moments kids have when they are, suddenly, all grown up. They sleep through the night (still waiting, Kaya…), start to talk, or go off to school without glancing back over their shoulders. It happens over and over again, these little transformations that force us to reconsider who they are. The last time I showed you these chickens, they were eggs wrapped in Kaya’s socks. My mother had brought them for me to hatch in the incubator and now, after a few mishaps along the way, we have seven chicks from those eggs. (There are 4 lavender Ameraucanas and 3 Copper Marans.) I stopped to watch them for awhile on my way out to the manure pile and thought of how far they’d come. How did they get big enough to range free? They were very busy scratching around, and it is a funny thing , but those tearing, grasping feet, which can destroy newly transplanted seedlings in an instant, are a heartwarming sight in the right context. 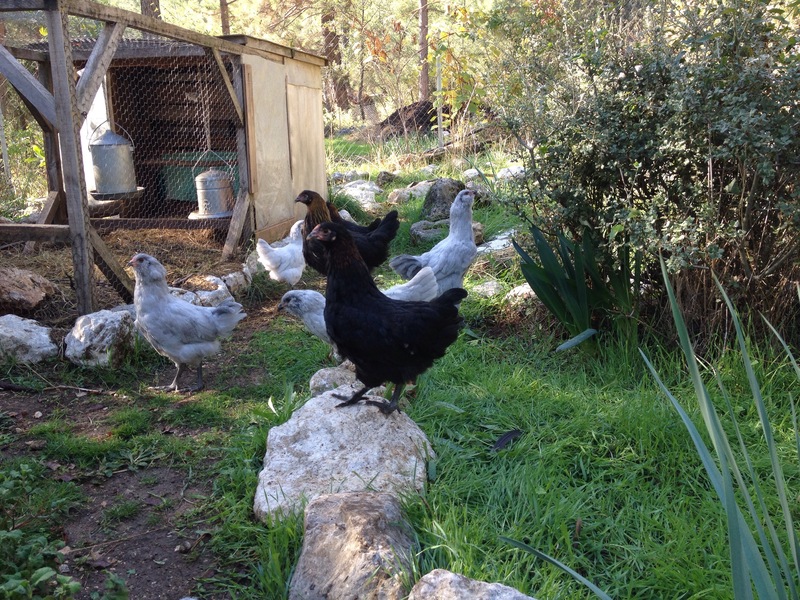 Meanwhile, in the Orchard Coop, our Australorps are just starting to lay, so they’ve come full circle – from eggs to eggs. Can you believe how big they are?? And I love how the Ameraucanas are the same color as the rocks.